Commercial Invoice – Commercial invoices are available at any commercial stationary store. Most companies use their own standard commercial invoice. 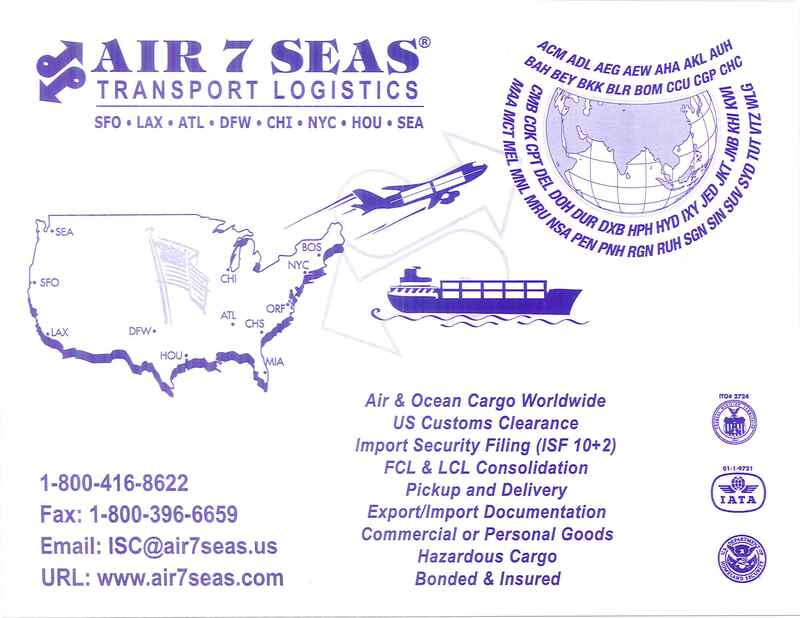 AIR 7 SEAS Transport Logistics Inc shall not be held liable for delay caused by highway obstruction, or faulty or impassible highway, or lack of capacity of any highway, bridge, or ferry, or caused by breakdown of mechanical defects of vehicles, or equipment, or from any cause other then negligence of the carrier; nor shall the carrier be bound to transport by any particular schedule, means, vehicle or otherwise then with reasonable dispatch. The carrier reserves the right in regards to the routing, method of transportation, selection of carrier and delivery agent. The assigned carrier shall have the right in the case of physical necessity to forward said property by any carrier or route between the point of shipment and the point of destination. Transit time will depend on your Origin and final destination & volume. If you are shipping an exclusive container from a high traffic origin to a high traffic destination transit will be faster. If you are shipping a less container load from a low traffic origin to low traffic destination, it will take longer. Transit time is never guaranteed. The estimated time of arrival in most cases is not guaranteed and is only an estimate based on compiling past experience of shipping time frames to the region from the date of cleared full payment at origin or the required customs documents if applicable. LCL and consolidation shipment transit time will vary. The learned PU and ETA may be influenced by the carrier-s profit logistics planning as well as government agencies worldwide, their procedures and regulations (Customs, etc), strikes, equipment availability, or the unexpected such as natural disaster or war conditions. 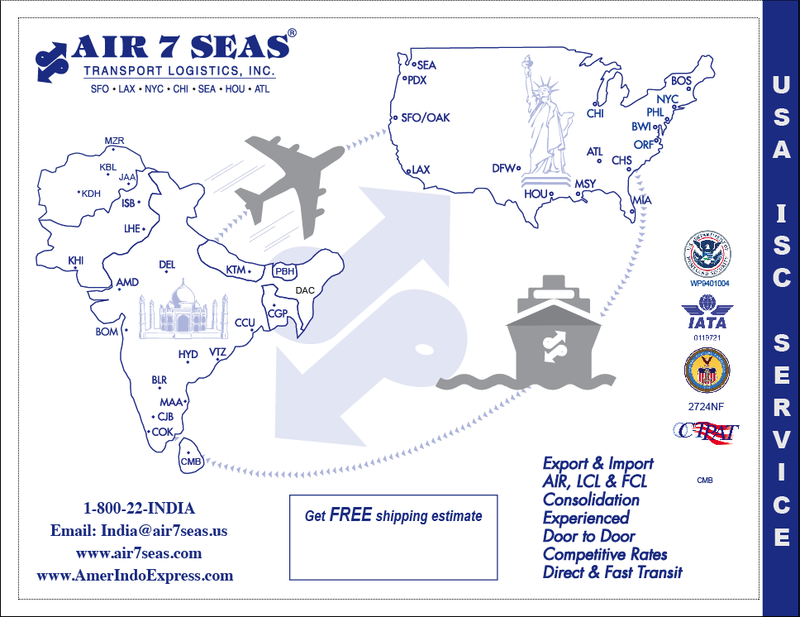 Please note that our carrier’s objective is to expedite all shipments by eliminating the costly warehousing and terminal charges. First and foremost our main goal is to provide you a timely pickup and delivery, and the excellence of service you deserve. All inquiries regarding pickup, tracking, transit and delivery must be communicated directly with the carrier. Smaller sea shipments will be sharing the space inside a container with other shipments and transit time is always longer than FCL (Full container load) shipments. You are charged based on the Cubic Meter (or Cubic Feet) or Metric Ton, which ever is greater.